To be found at the North Cape by the tourist Center: The "Children of the world" sculpture created by Seven children from Thailand to Tanzania. Here photographed at a visit a grey day in January. It was strange being almost alone around this great sculpture partly covered in snow in a very low light environment - still with a fading sun in the clouded sky. And I think this photo version of the sculpture on this day for me was a small highlight as I walked around in solitude at North Cape - outside and inside the big North Cape center. The “Children of the World” sculpture was started in 1988 when author Simon Flem Devold randomly selected seven children from seven countries – Tanzania, Brazil, USA, Japan, Thailand, Italy and Russia — to visit the North Cape to dream of “Peace on Earth”. During their seven day visit, each of the 8-to12-year-old children made a clay relief symbolizing friendship, hope, joy and working together. In 1989 the reliefs were enlarged, case in bronze and erected in a semi-circle outside the North Cape Hall. 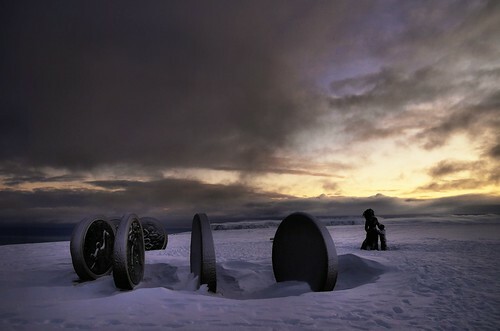 A “Mother and Child “monument by sculptor Eva Rybakken points toward the seven disks.